The Current issue of “The view from here” is concerned with nanoscience in drug discovery. The Editor, in Sloane Square after listening to the Haydn Trumpet Concerto played by the erstwhile James Fountain. 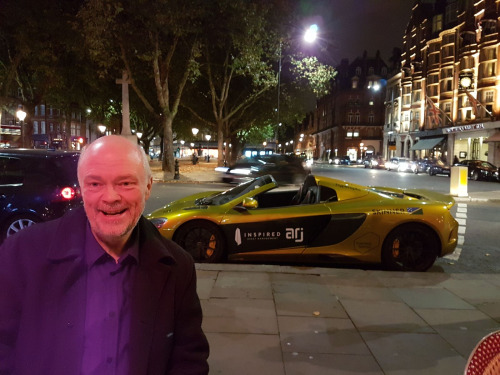 Wishing he could afford the McLaren casually parked behind him. I’m sure you will have noticed the increase in interest in nanomaterials in the field of drug discovery of late. I certainly can be sure that at least 2 articles per week appear on my desk related to nanoparticles or nanoscience in general. Such has been the interest that I have commissioned 2 complete Special Issues devoted to all things nanoscientific. The first of these Special Issues was published in September this year, on the topic of “Therapeutic Nanomaterials”, another is in an advanced state of preparation and is concerned with “Nanotherapeutic Strategies”. As a result of this recent interest, I decided that it was about time we featured some of the excellent articles we have published in the last year or two. None of these papers figure in either of the Special Issues that I mentioned (I didn’t want to have to issue a spoiler alert! ), but I hope that they whet your appetite and that you will beat a path to them to see what is currently achievable by nanomaterial approaches. I believe that they will become ever more important in the next few years. The first article in this month’s offering is entitled: “The use of nanoscaffolds and dendrimers in tissue engineering”, by Bapi Gorain, Muktika Tekade, Prashant Kesharwani, Arun K. Iyer, Kiran Kalia and Rakesh Kumar Tekade. In this article, the authors discuss the applications of biocompatible dendrimers in tissue engineering as a result of their similarity, in some respects, to components of extracellular matrices. Such dendrimers are molecules capable of supporting and restricting cells and biologically relevant molecules within a 3D microenvironment. The review covers the structure and preparation of these nano support molecular networks and the challenges and current successes of these approaches in the field of tissue engineering. The second featured article is by Weiwei Fan, Dengning Xia, Quanlei Zhu, Lei Hu and Yong Gan of the Shanghai Institute of Materia Medica, Chinese Academy of Sciences, Shanghai 201203, China and is entitled: “Intracellular transport of nanocarriers across the intestinal epithelium”. The article is concerned with the impact that nanocarriers can have in transporting small molecules across the major barrier to such molecules in the gut, that is, the intestinal epithelium. They point out that, to date, improvements due to nanocarriers has been small and remains an unmet need. The authors go on to discuss the fundamental principles involved in nanocarrier transit through the intestinal epithelium, such as apical endocytosis, intracellular transport and finally basolateral exocytosis. Understanding such processes is essential in designing and developing novel nanocarriers to enhance oral bioavailabilty via this route. Finally, we come to the article “In vivo fate of lipid-based nanoparticles” from Jianping Qi, Jie Zhuang, Yi Lu, Xiaochun Dong, Weili Zhao and Wei Wu from the Pharmacy Departments of Fudan University and Shanghai University of Medicine & Health Sciences, Shanghai, China. The authors explain the various routes that such particles can be broken down and/or trafficked. The exact lipid composition has a great effect on how the particles are initially handled and a high proportion are initially broken down by lipases in the gut. Following this, those that survive the initial lipolysis can translocate around the general circulation, eventually reaching various target organs. They outline factors that impact the in vivo fate of these lipid nanoparticles; these include: composition, size, formation of protein coronas and surface decoration. Understanding the principles of lipoparticle breakdown allows a more directed approach to rational design of molecules and take advantage of the factors of breakdown and recognition to design optimal bioavailablity and distribution of APIs.